My group is currently recruiting people to fill two graduate student positions. We will also be recruiting a researcher to fill a postdoctoral position in the coming year. We are looking for candidates who are passionate about genetics, genomics, and research. Ideal candidates are creative, hard working (while maintaining a work/life balance), and self starters. Our group is strictly computational, so candidates should enjoy working on computers and analyzing data. Candidates should be willing to learn programming (typically in R or Python), or already have some programming experience. The June/July issue of the Charolais Journal contained an article I wrote. Click this link to download a copy of the article. In the article I discuss trends I see coming in the development of genomic prediction. Please provide feedback in the anonymous survey below. Discovery about PRRS virus could save swine industry hundreds of millions of dollars; Exclusive deal signed with global leader in animal genetics COLUMBIA, Mo. ­— Porcine Reproductive and Respiratory Syndrome (PRRS) virus was first detected in the U.S. in 1987. Pigs that contract the disease have extreme difficulty reproducing, don’t gain weight and have a high mortality rate. To date, no vaccine has been effective, and the disease costs North American farmers more than $660 million annually. 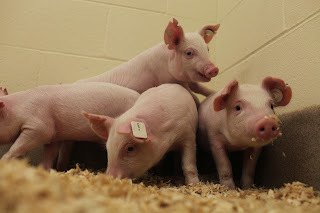 Now, a team of researchers from the University of Missouri, Kansas State University, and Genus plc have bred pigs that are not harmed by the disease. Prather PRRS from MU News Bureau on Vimeo. Limousin breeders and their commercial customers benefit greatly from new breeding and selection tools. The North American Limousin Foundation (NALF) has launched genomic-enhanced EPDs (GE-EPDs) with the fall 2015 international cattle evaluation. This provides GE-EPDs for all Limousin and Lim-Flex® animals that have completed DNA testing for genomic profiles. A recalibration in cooperation with GeneSeek® and the Canadian Limousin Association has supplied genomic profiles on more than 4,500 Limousin and Lim-Flex animals. Molecular breeding values from either a high- or low-density genomic profile test are then blended into EPD calculations to produce GE-EPDs. This recalibration has led to the doubling of the number of animals included, the number of traits enhanced, and the genetic correlations.